Chocolate has been a part of our culture since the time of the Aztecs when it was prepared as a drink with spices and corn masa. 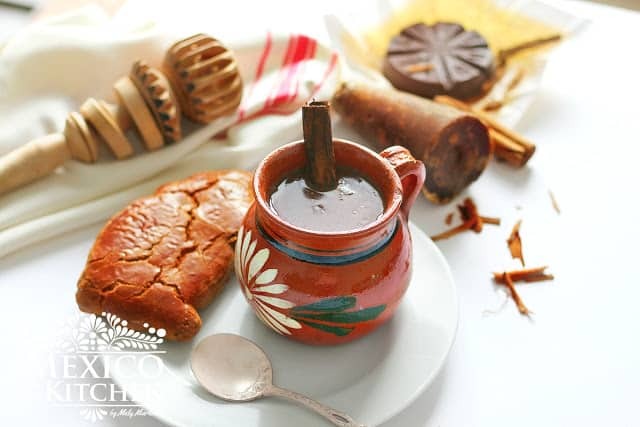 Even to this day, we love to enjoy Champurrado, especially during the holiday season. This is a Sponsored Campaign with We All Grow Latinas. All opinions are my own. This recipe is for the classic water-based Champurrado, but you can also make it using milk, and can even add some cloves or orange peel for some extra flavor. Whichever way you prepare this popular drink, I’m sure you’ll enjoy sharing it with your loved ones during these holidays! And now that we’re in the holiday spirit, allow me to share with you some of the perfect Christmas gifts, that will leave your loved ones smiling from ear to ear (at least I was when I got them!). I love these products and enjoy them in my everyday life. Where can you get these products I speak of? Amazon, of course! I hadn’t realized how many Amazon products we use in our home, from our Fire Stick we use for watching our favorite movies and shows, to my Amazon Prime account that lets me enjoy free two-day shipping on many items from Amazon.com. But the things I love the most are my Fire Tablet and my sleek Kindle Voyage. 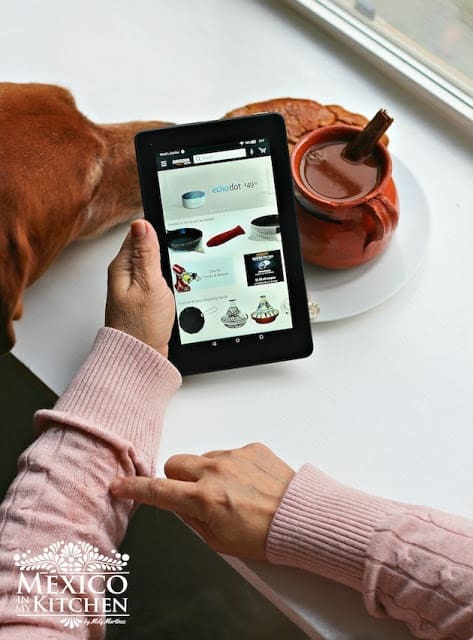 I use my Fire Tablet to check social media channels, browse the web, and even to watch movies and listen to music while I cook. It has a 7” display, a fast processor, and, most importantly, dual cameras to take lots of pictures (food pics included!). My other recommendation for you is the new Kindle Voyage. It’s the thinnest and most advanced kindle, and I like that you can read your books for weeks without having to charge the battery and that the built-in light adjusts automatically, making it really easy on your eyes. 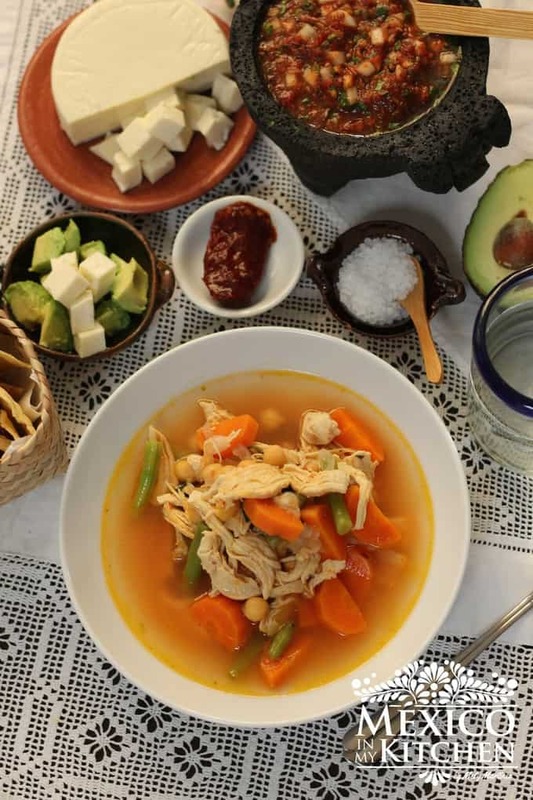 I hope you like my gift recommendations, and prepare this delicious Champurrado to enjoy while reading your favorite books or watching a nice holiday movie with your family. Once the piloncillo or sugar has dissolved, add the 2 Mexican Chocolate Tablets and allow about 5 minutes to dissolve, stirring from time to time. Meanwhile, in a medium bowl, pour the other 2 cups of water and mix in the masa harina. Mix well with an egg beater if possible to avoid forming any clumps. Make sure you have a very creamy texture. When the chocolate has completely dissolved, slowly pour the masa harina mixture into the saucepan while stirring, to make sure there are no clumps. If you want to be safe and avoid masa harina clumps, use a strainer to pour the mixture. Turn the heat to medium-high until the Champurrado starts boiling, and then reduce the heat to low and gently simmer, stirring constantly. After 6-8 minutes the mixture will thicken. Allow cooking for 5 more minutes. Place 6 cups of water in a large saucepan along with the piloncillo and the cinnamon stick. Heat water until it starts boiling and then reduce the heat and allow to simmer for about 10 minutes until the piloncillo has melted. If you are using regular sugar, this step will take less time, since the sugar will dissolve in about 4-5 minutes. Turn the heat to medium-high until the Champurrado starts boiling, and then reduce the heat to low and gently simmer, stirring constantly. After 6-8 minutes the mixture will thicken. Allow to cook for 5 more minutes. Be careful while serving the champurrado, its thick consistency keeps the drink extremely hot! Some people like a very thick consistency. Try the recipe with the ingredients mentioned above, and if you still want a thicker consistency, then add 2 or 4 more tablespoons of masa harina mixed with ½ cup of water. You can use half the amount of water and half of milk, or just milk to make the Champurrado. Don’t forget to follow us on Instagram and Facebook. This is a sponsored conversation written by me on behalf of Amazon. The opinions and text are all mines. Recipe in Spanish Cómo hacer Champurrado. Champola an easy fruity frozen treat! I love your recipes! My friends and I were looking for the Ponche Navideno and here it was thank you so much. 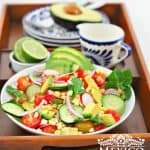 Thank you for trying the recipes, enjoy! what's the difference between a champurrado and chocolate caliente? The mexican chocolate used for the hot chocolate also has cinnamon. Thanks. Yes, the Mexican chocolate sold in a tablet for includes cinnamon. The difference with the champurrado is the addition of corn dough or masa-harina which thickens the drink. I hope you try it! It turned out great! Thank you! Una pregunta. Tradicionalmente el champurrado es una bebdia tomado con tamales? Este Navidad tengo ganas de hacer tamales y estoy pensando en hacer el champurrado. Gracias! Champurrado is a drink served with Buñuelos & also with Tamales. 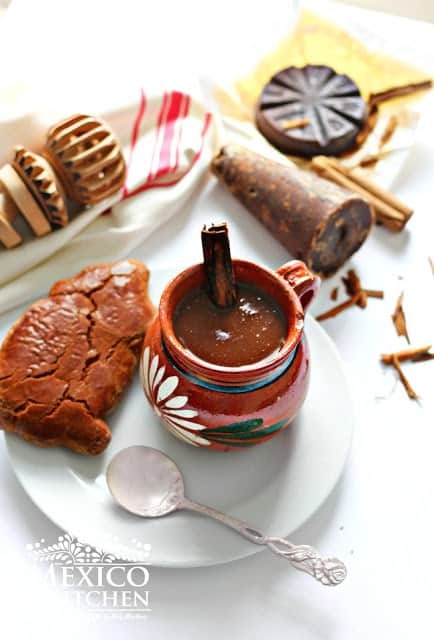 Each region of Mexico has different traditional foods to serve with Champurrado. Rosca de Reyes is usually served with hot chocolate or Champurrado, too. Can you use corn starch or is that the same as masa harina? Champurrado is usually made with corn masa or masa harina, but if you can’t find it. You can use corn starch. Thank you for the recipe, it tastes just like my grandma used to make it. Why do some people use cloves too? Does not using cloves make any difference? It adds a little bit of spice flavor. Hello, I tried your recipe and halved the ingredients. I used Abuelita chocolate, but the result was grainy and tasted more strongly of cinnamon than sugar. I ate a chocolate tablet by itself and it tasted like that too. The graininess might be that I didn’t melt the sugar for long enough, but would the recipe work without cinnamon and using a normal chocolate? Mexican Chocolate is usually like that. Perfect. Brought back memories from chilly mornings in Mexico City. Thank you for trying the recipe. Cold weather and champurrado make a great pair. I loved the recipe however if i made it too thick. Is there a way to make it less thick? Just add more milk or water. Enjoy! So if I substitute milk for water, is it the same 8 cups? Also will the milk make it thicker? You can substitute the entire amount of water for milk. Or just part milk and part water. The milk will not make it thicker. I made this recipe for New Years Day for my family. This recipe tastes just like my Nana’s champurrado. I love it & it tastes so good! 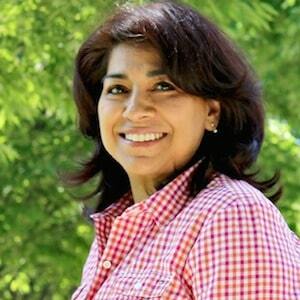 Thank you for trying the Champurrado recipe, so glad to know it brings back sweet memories to you. I love your recipes! Is there a substitute for the chocolate tablet if I can’t find it at my local grocery store? You can try the homemade version on this link and add the masa harina.